Service user management solution for care providers. The document module allows management of client and non-client documents. View and edit documents online without downloading shadow copies. Powerful search tool including inside document data. Multiple Linking of documents with any client data. For example, doctor referral letter linked to an annual medical review. Document sharing or access restriction for sensitive documents. Automatic document creation and linking, pre-filled with data from anywhere in the system. CalmoniCare can provide a respite reservation system which allows the respite manager to control bookings through availability, suitability over multiple locations. 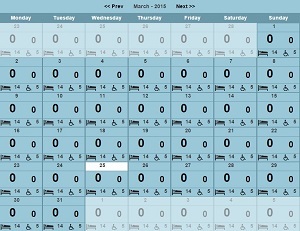 Similar to an hotel booking system, it allows planning and multiple request types.